Pre-production black faceplate VCAM. Final version available only in silver/ aluminum. The 4ms VCAM is a 4x4 matrix mixer containing 16 SSM VCAs, mutes and offset/ attenuation pots. For more information, click here. The VCAM looks great and is logically laid out. The mute buttons are responsive and a joy to play. The trims are not as fiddly as one might think - I can still get my large fingers in for live mixing of levels. I was worried I might get lost in the forest of knobs & switches, but it quickly becomes second nature. The routing caused some initial head-scratching, but that's more down to the possibilities than layout. The easiest way to grasp the VCAM's concept is as a standard mixer with auxes/ busses - if you do though, you might wish for more inputs: 4 aren't enough if you want to replace your external mixer at a gig. Also, this isn't necessarily the role the VCAM was designed for - the fun starts when mixing different sources. The VCAs sound clean, are musical when overdriven and respond nicely to audio-rate AM. The VCAM is 'louder' than my Cwejman VCAs at a setting of '10' i.e. you can get unity gain manually on the 4MS, whereas the Cwejman leaves headroom for eventual CVs. The punch afforded by the VCAM's soft limiting is great, however, there is a flip-side to the chosen response: at lower CV amplitudes, the envelope is 'pinched' and equal-power crossfades are tricky, though not impossible. I asked Dann of 4ms about this and he suggested using higher voltage levels for crossfading (0V-8V and 8V-0V linear envelopes). The voltage is limited past 4V, so everything below that is linear, anything above fairly constant, so dead spots are avoided. This is the easiest way to crossfade without resorting to a log- and anti-log sine. The forthcoming 4ms PEG will apparently make this process easier. This amplitude-dependent response requires pre- or post-VCAM attenuation to match levels. This was my first surprise with the VCAM: despite its features and size, it needs some supporting modules, or, like the QMMG, you need to use other channels to get the most out of it. For example, for a gated AM sound, you might want to patch your modulator to an external offset/ attenuator like the A-183-2 or A-129-3 prior to patching it to the CV input on the VCAM. Another example might be it's use as an VC effects send mixer. Because gating happens on a per-channel input - i.e. there is no normalization - you would need to pre-gate your signals: if you gate your 'dry' VCO signal on channel 1 and then open your 'FX send' on channel 2, your signal would be a constant, un-gated tone. Depending on the patch, another solution would be to simply mult the envelope. This is not a criticism and makes absolute sense given the VCAM's structure. To be honest, I'm sure part of this is down to the temptation to run an entire mix through the VCAM, effects and all, which might be to miss the point. The VCAM excels at feedback patches, where one might not need all four channels to generate complex sounds. Part of the fun is in the control, the other in not knowing which routing will lead to which result. Mixing different sources (audio, CVs, FX & filter loops) can lead to unexpected, sometimes chaotic, cross-modulations. I didn't think I could get excited by a bunch of VCAs, but the VCAM opens-up new possibilities. 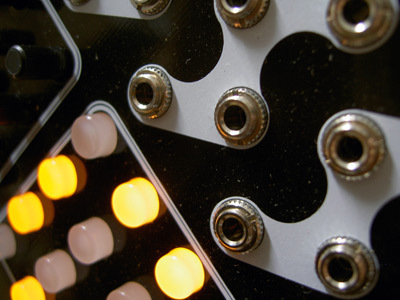 Having all routings in a patch in one module makes it perfect for performance and experimentation and watching sixteen LEDs glow in a grid is truly mesmerizing! Factory settings for the VCAM's max gain are calibrated for 'soft limiting' rather than clipping, which I find sounds very musical and makes a nice contrast to my 'character-free' Cwejman VCAs, so I'm happy to leave this trim as is. The manual trim pot is set to give ca. -55dB of attenuation and means the corresponding LED is dim but not off, which is a useful indicator of which channels are actually muted. However, it does also mean that signals are not fully cut. This might have an effect if it is part of a feedback loop. The problem arises when the input is a CV or when the CV controlling a VCA is inactive (e.g. an un-triggered envelope @ 0V). Without muting the channel, it will continue to mildly affect its destination. For the former, the answer is to simply mute the channel. In the case of the idle CV, or if you want more attenuation, a trim might be in order. Many thanks to Dann for a cracking module! I'll be playing live at 48 Stunden Neukölln this Saturday, 18th June. Weather permitting, I'll be setting up around 2 p.m. in garden 20 in the Hand in Hand Kolonie, Rütlistr. 8, 12045 Berlin. 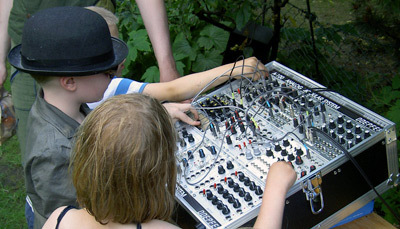 If you're in town, it would be great to see you for an afternoon of electronic sounds in the open air. 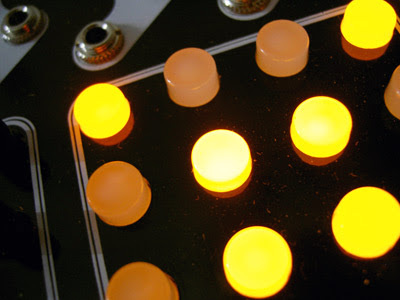 With so many cool new modules being released, it's easy to overlook some of the classics. 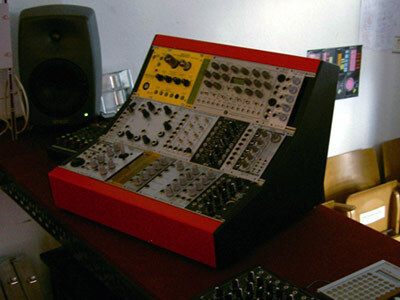 Similar to my A-156 quantizer epiphany, I've only just discovered the Doepfer A-199 Spring Reverb. Primitive though the effect may be, it's breathed new life into my system. I'd tried the A-199 before, but wasn't taken by it: I guess I was looking for reverb, when I should have been listening to the effect for what it was. While on a recent hiking holiday, I came across an old, rusted gate. Because of its age and construction, opening and closing it generated wonderful, resonant/ reverberated sounds. I 'played' this gate for a full five minutes and spent the rest of the walk thinking about how one might recreate its sound. The A-199's time had come. The one criticism that's leveled at the A-199 is its tendency to hum, but, keeping the module far enough away from the PSU and the springs outside the case, I haven't noticed this to be too bad. 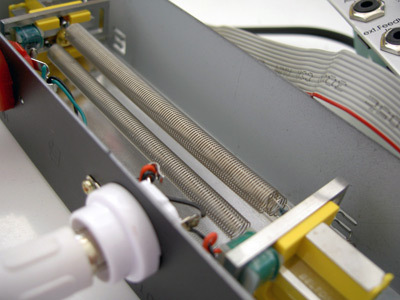 I'm also happy with the sound of the stock Belton tank, but if you want to change it, consult this spring reverb wiki compiled by Tim Stinchcombe for a suitable replacement. The A-199 is a lot of fun. 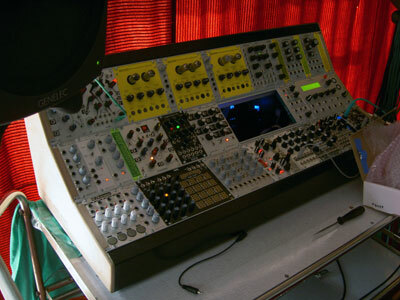 It can add simple ambience to sounds or be patched as a special effect. This module was the missing element in my system, adding space, colour and character - spring reverbs and modular synths seem to be made for each other. Spotted at Schneidersladen. 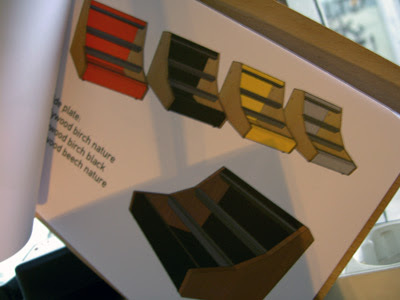 Cases come in a choice of colours and wood. PSU is a Tiptop Audio Zeus. Prices TBC, but could be around €1100 for the large (18U) and €800 for the small (9U) versions. 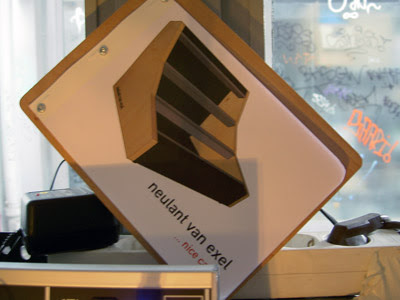 You might remember Neulant van Exel's portable case, the Klangformer. Turns out my server is not down: the domain was allowed to expire and my content deleted. I'm looking into a solution for my audio files, either on a new server or at Bandcamp. In the meantime, I'll start migrating my pictures to Google's Picassa. I don't know whether edited posts are re-sent to subscribers or followers, but don't be surprised if you get a slew of old posts in your inbox! This situation was caused by mis-communication which was out of my hands. Having to re-upload three years' worth of content is a royal PITA, but there is a positive side. It has served as a wake-up call and allows me to reorganize the blog to ensure this doesn't happen again. My server is down and, with it, most of my content.